Above, you can see the last photo I took a couple of weeks ago, the last time we did stuff in the garden together. I was away doing awesome charitable deeds last weekend, so Steve cracked on without me. He strimmed the strawberries back to ground level (sorry, but they are like a badly behaved child – spreading everywhere and bearing teeny tiny fruit just to annoy us) and covered them with cardboard. He also had a wood-chipper session which saw off all but the chunkiest branches that you can see above. Which means that quite a bit has been done between that, and today’s “before” picture. 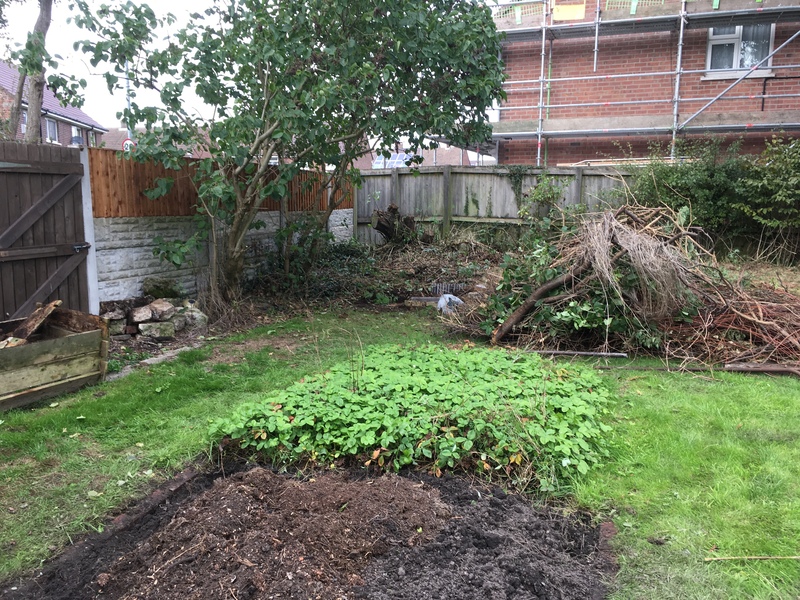 If you look closely you will also see some compost around the base of the raspberry canes – apparently fresh mulch leeches nitrogen out of hte ground, so this is an attempt to redress that balance. 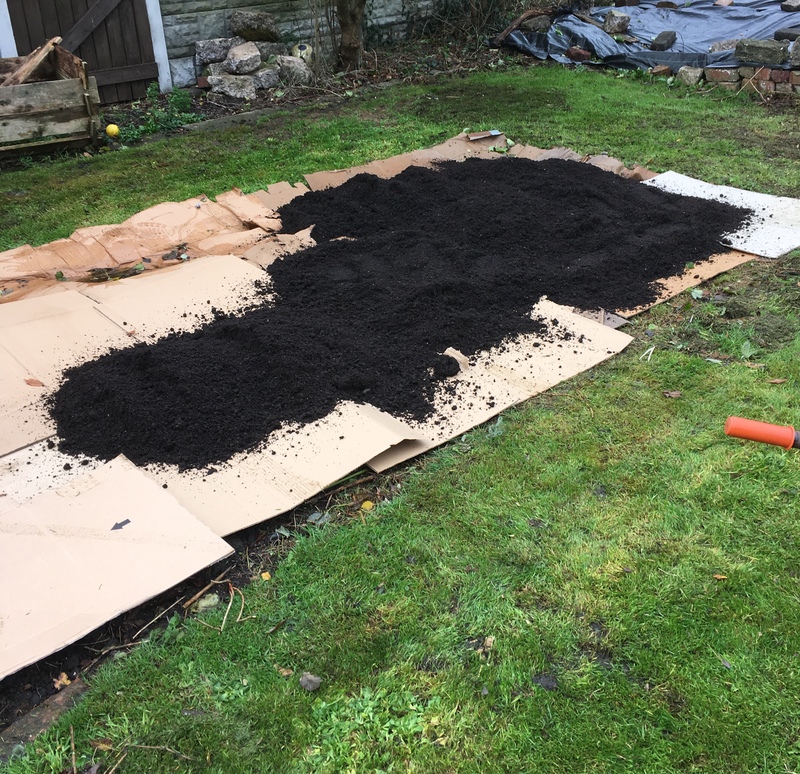 Today’s activity was centred around laying out the paths we want around the vegetable patches, and putting a layer of compost (of which we now have two ENORMOUS bags) over the cardboard. Oh, and completing the layer of cardboard. By the time we had finished, it had turned into a LOVELY day, which plays havoc with my panorama-ing. We have 1m paths down each side, across the back and in front of the existing bed. The plan for the rest of the patch is to split into 3 beds across by 2 beds along, which we think will give us some good flexibility in terms of crop rotation. Another weekend at home in the garden… The 3 panoramas are “before”, “after day 1” and “after day 2”. We had a serious focus on covering over the big old veggie patch, and tidying up along the left hand side. Steve sorted covering the veggie patch. We think reviving this space might take more than one season. It’s always been really really weedy, so it’s as well to take the time and do it properly. 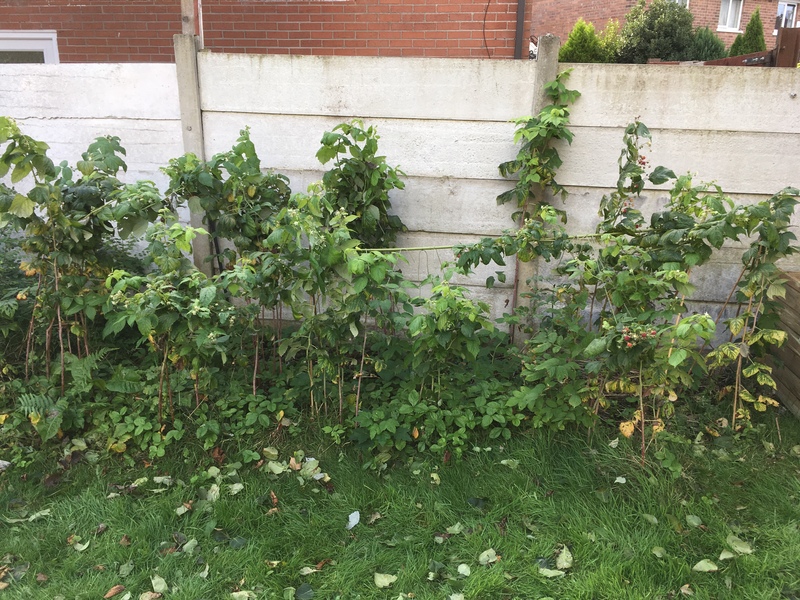 I weeded and mulched around the raspberries, supported them with some bamboo canes, and then attacked the overgrown bushes next to them. I also put up the second compost bin. Day 2, for Steve, was all about our new toy – a wood chipper. 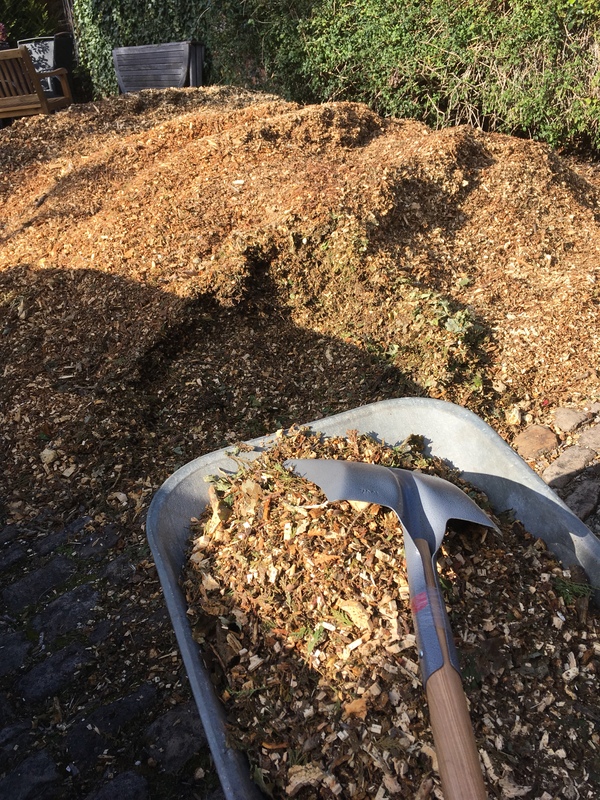 Depending on how leafy the input is, we’re either generating mulch, or chewing stuff up to go on the compost heaps. 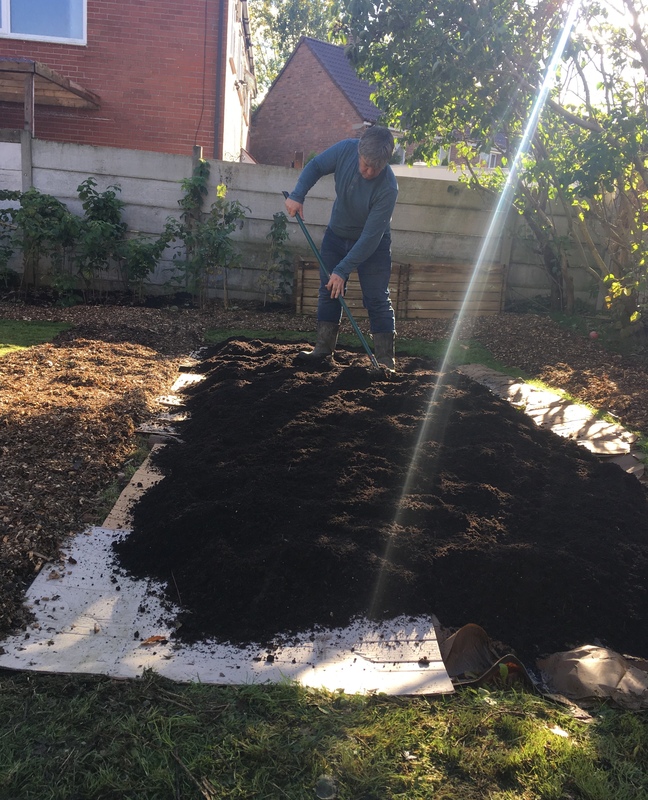 Having had the tree taken down that was overshadowing the old veggie patch, we are not even slightly short of mulch. The large pile featured below is where the car is usually parked. The above picture also features my favourite new tool – a shovel! We’ve been “struggling” with a short-handled shovel and a spade for ages. Steve acquired this silver beauty while getting the covers for the veggie patch. He also got weed suppressing cover for making paths, which will then be covered with (you guessed it!) mulch. Having a decent shovel makes a massive difference. I know, I’m easily pleased. We’ve been lucky with the weather this weekend, and have both ended up feeling a bit sun-kissed. The rain has set in now (Sunday evening) and happily its onset coincided with the time where we had both pretty much had enough gardening fun for one weekend. Below is the view from the new compost bin. The incinerator’s on the go here – I think it was because of how long it took to burn stuff yesterday that Steve decided a wood-chipper was a prudent investment! 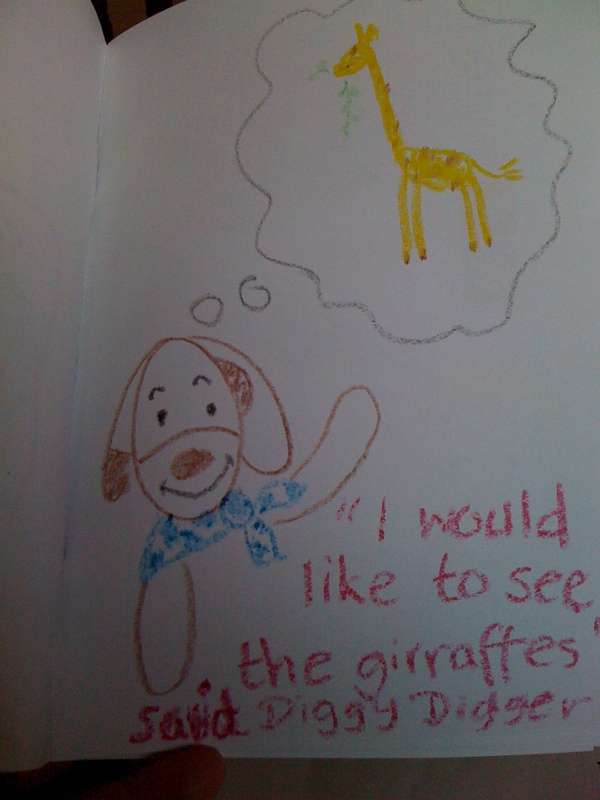 And, because I’m writing this so of course it’s all about me, here’s a close-up of my awesome work on the raspberries. The canes still have buds & fruit on them, so I’ve concluded they must be autumn fruiting as well as summer fruiting, so I’ll chop these canes back in the spring. 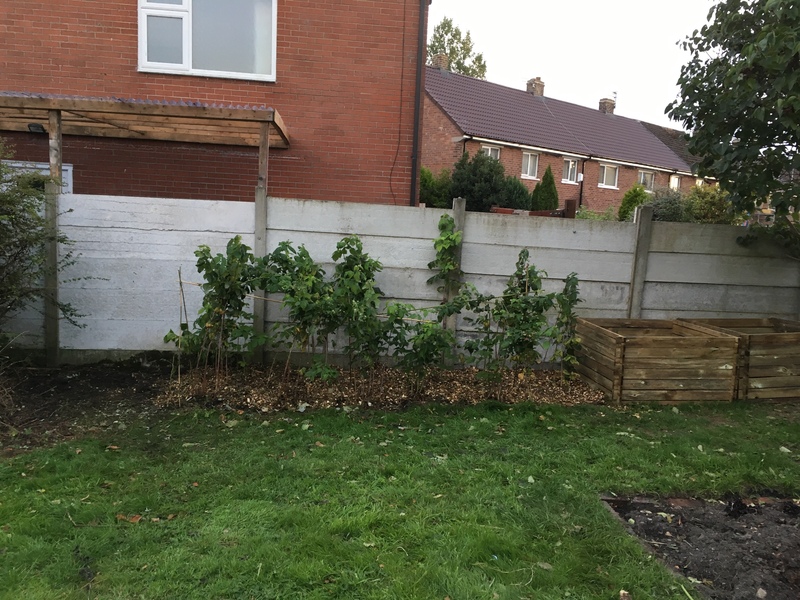 Today’s big achievement, which probably means I won’t be able to walk upright tomorrow, is that I’ve cleared the shrubs to the left of the raspberries back at least another 6 feet (a fence-panel’s worth), including digging out the roots. I nearly had Steve take a picture of me standing over them like a big game hunter, but decided at the last minute that that would be in poor taste. Suffice it to say, I was dubious that getting them out was within my capabilities, and I’m please to report that my dubiousness was misplaced. 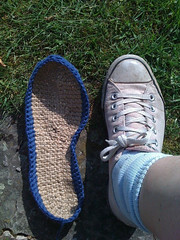 A while back – more than a year, thinking back, I had an idea that I would make the summer shoes Athena from Knit on the Net (it used to be free, but will soon be available to buy as a pdf pattern) – and so identified which yarn I was going to use for the top from my stash and set about trying to work out what to do for the soles. To cut a long story short, I decided to make my own out of string which seems to have worked better than I hoped – although they aren’t terribly substantial, so the next pair I make, I may do double-layer. 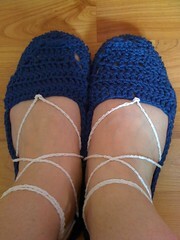 Especially as it seems the next pair I do are to be for Lily, and I’ll deffo have enough string left. Then I read through the pattern. It seemed quite bitty and did a few things I didn’t want to do with my shoes – to be honest I’d be happy with plain espadrilles which isn’t far off what I’ve gone for here. The yarn I’d identified – some lovely burgundy hemp I got at the i-Knit event a couple of years ago – turned out to be (when I dug it out of my stash) far, far finer than I remembered it, and so not suitable for the project in hand. I dove into Mum’s stash and came up with some aran-weight probably-cotton in a nice dark blue. It looked as though there was enough left, so on with the show. Then bit by bitty bit, I worked my way round until ta-daa! Shoes. And here are my pattern notes, if you want to try to recreate these for yourself! 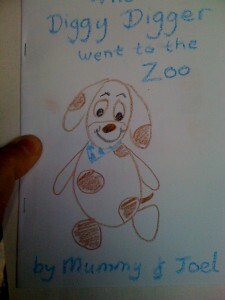 For a while I’ve been intending to write a book for Joel. I’m now under pressure to make “When Boo-boo went to the beach” a reality. The highlights, above are… a new fence that stretches from side to side of the whole garden #security, and unfortunate gap in the lilac tree screen to the left of the gate, where two of them have mysteriously died :-(, and on the right, the original vegetable patch with 2 years worth of rampant weed growth and bits I’ve cut off trees and bushes around the garden. The bed straight ahead is knee deep in wild strawberries, apart from where it’s thigh deep in nettles. Really, the only things worth salvaging are the rhubarb and the raspberries. I picked up the litter, dug out half of the strawberries, and dug over that bit of the bed, then built one of the new compost bins (a wooden slatted effort, barely visible off to the left, next to the raspberries) and moved the contents of the old compost bin into a combination of the new bin and the emptied strawberry patch. And moved the rhubarb. Steve was a complete hero, and cleared away A LOT of the old veggie patch. 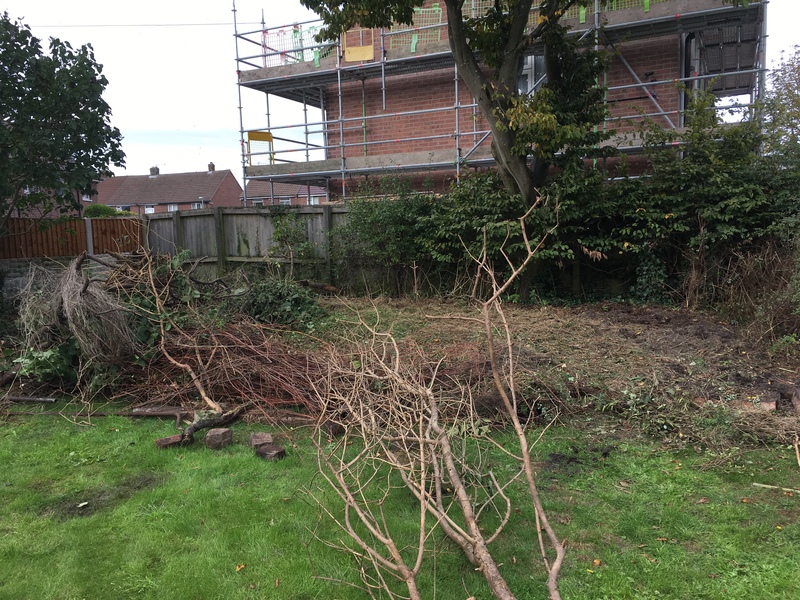 There was all sorts on there – bean frames, wooden planks, piles of dead wood, plus the “hedge” had grown out at least 6 feet from the fence. Oh, and a bit of path that mum & I started to build about 10 years ago. There’s a big pile of concrete rubble in the back corner as well, which he’s moving out of there. I cut back the lower branches of the lilacs, as they kept attacking me when I was emptying the compost… sadly, the Hayes-manufactured compost bin has pretty much had it – any slots that stay together are doing so more out of habit than anything, by now! I just (this week) found a new app – it’s basically a self-publishing platform where The Internet can comment on your work once you’ve uploaded it and exposed your soft underbelly, without the aid of an experienced editor to spare your blushes. I have yet to expose my own underbelly, but in the immediate short term am sampling others’ work, and enjoying it. 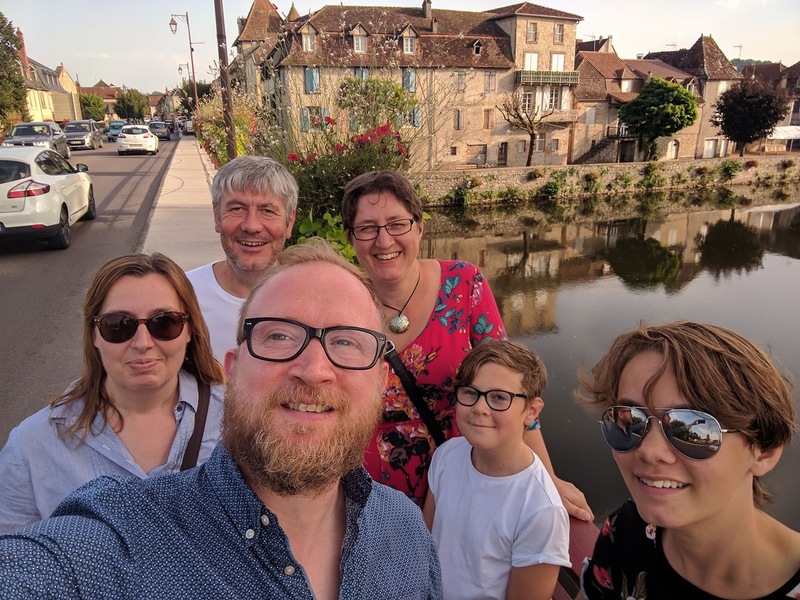 In some ways I’m finding it oddly inspirational – I’m thinking about what I like and don’t like about what I’m reading, thinking about how I might do it better, which bits I like, which bits ring like clanging clichés, and so on. It’s spurred me on to finish the ending of the short novel/story I’ve been writing myself over a few years, and to appreciate that although it’s not finished-finished and I’m not super-happy with the middle of it, it’s a damn sight better than some of the dross out there, even if I do say so myself. So, I have an ending and am about to let Other people read it. This feels like a big step. A very exposing step… we’ll see how it turns out, eh. The other thing I’ve been inspired to do is rewrite at least one scene that I read and thought was a nadge unrealistic and could be done, if not better, then differently. This is not-from 12 seconds by tall_girl (just realised that if she’s tall, she could probably take me in a fight. Oh well, at least this is the internet and she doesn’t know where I live…) which is an interesting and compelling read – I’m going ahead and reading the prequel in spite of the shortcomings of 12 seconds, which are mainly consistency when referring to characters’ by name and the armed forces. This should be thought of as exploratory fan-fic rather than a criticism. Julia pushed the last piece of bacon around her plate, not wanting to finish. Finishing meant she would have to leave the café and go home. Home to the family who last night she discovered had been lying to her for the past two years about who she was, and how she lost her memory. She sat there, as she toyed with the bacon, her long, dark hair creating a protective barrier between her and the rest of the world. The café was small, but impersonal if you wanted it to be. Greyed formica table-tops and elderly plastic yellow chairs echoed of brighter days, before the extractor fans were coated with grease and the spoons bent out of shape. She was about to spear the bacon and lift it to her mouth, when a cloud of second-hand alcohol invaded her space. “No,” Julia spoke in a monotone, not even looking at him, as she lifted the last piece of bacon towards her mouth. “Come on,” the man with three days’ worth of stubble and dry eyes grinned, the corner of his mouth tilted up in a smirk, “we could get crazy.” He started to chuckle softly, and Julie felt her stomach turn over at the suggestion. Julie waited for those words to sink in before she continued. She could see the cogs whirring as he tried to process what she had said. Julia realised she had overstepped the mark when the smirk vanished from his lips, and his eyes grew dark. His hand whipped out with surprising speed, given the air of whisky about him, and gripped her upper arm to drag her out of her seat and to her feet. “What did you say, girlie?” They were nose-to-nose. And then, before Julia knew what she was doing, the drunk was nose-to-floor, and she was astride him (in a not-getting-crazy-well-not-in-that-way way), his arm twisted behind his back, and her bacon-fork pressed lovingly into his neck where, she presumed, his carotid artery was closest to the surface. Muscle memory is a wonderful thing, she thought, wryly. She heard crockery smashing, as she had clearly attracted the attention of the staff behind the counter. The drunk struggled, but found, to the surprise of everyone involved, that he couldn’t move. Julia, having no idea how she had managed to achieve this “victory”, now realised she had no idea what to do next. She felt the presence of someone standing behind her, and she half-turned to face them, then froze. It was the man from the park. Marc. The man whose unexpected birthday card to her mother had kicked off this whole who-am-I episode. Her former fiancé, apparently, if only her amnesiac brain could allow her to grasp that fact. “Allow me?” He gestured towards the man on the floor, with an open, uplifted palm. Julia looked from his hand to her fork, still pressed into the man’s neck, then back. She, somewhat awkwardly, put the fork onto the table next to her, and took Marc’s offered hand, to steady her to standing. It wasn’t a big café, and there wasn’t a load of space between the tables. They wound up standing quite close to each other. It was weird for her to think they had been so intimate, and yet she couldn’t remember a thing about him. She clocked that as she stood up, her recently reinstated dog tags had escaped from under her top. She saw Marc’s eyes land on them, and they exchanged a glance of understanding. He knew that she at least knew the basic facts, if nothing else. The use of her surname broke the tension between them. Julia nodded. She needed to ask him some questions. Questions her family either couldn’t, or weren’t willing to, answer. She wanted answers, but now that there was a risk she might get some, her heart started beating faster. Did she really want to know? “I know a place,” Julia zipped up her hoodie, tucking the dog tags back in, and led Marc out of the café. I’m quite the sci-fi-fan, so this book appealed to me before I’d even heard the title. I put it on my list as it was brought to my attention by my friend Hannah (a properly proper computer scientist, she teaches stuff to other people and gets excited about robots, and stuff). As I put it on the list I read the other reviews in Goodreads, which were quite scathing. Some stuff about the author being very pleased at how clever he is and how the book read a lot like a series of blog posts. 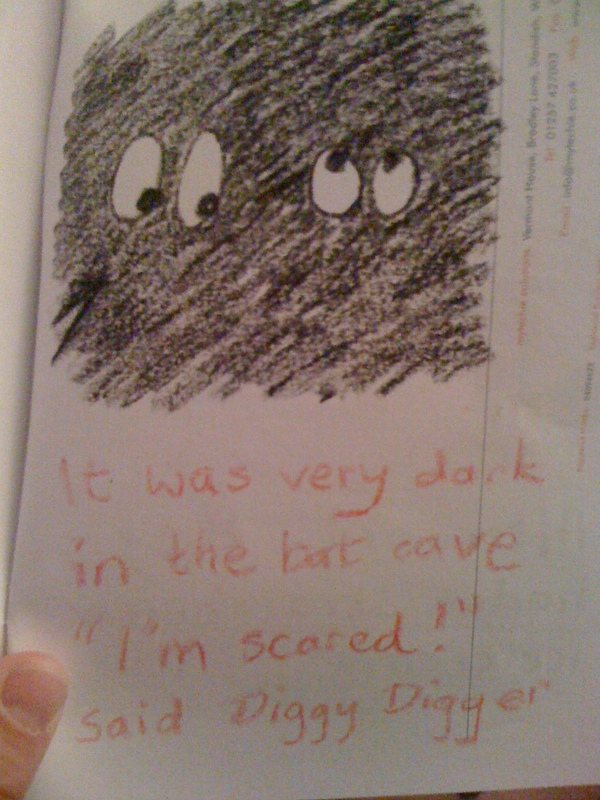 At least, I think it was this one they were talking about: that’s how I remember it, anyway. The premise draws on the well-known sci fi lore that any un-named redshirt who goes on a mission to a planet’s surface with named characters who feature regularly in the narrative in any film or series is doomed. The book starts by describing the back story and current predicament of a red-shirt who is on a planetary mission with the captain and the chief science officer of _The Intrepid_. Take a wild guess what happens. For a moment, I had a strong fear that this book was going to be a long series of very short stories with a lot of back-story explanation. I didn’t want to read *that* book. It was all fine, though, that was effectively a prologue. The main character in *our* narrative, one Andy Dahl, joins _The Intrepid_, and it doesn’t take him long to work out that there’s something odd going on. His colleagues in the ship’s lab disappear whenever any senior crew appear, people seem super-reluctant to go on surface missions, he’s warned off going to the bridge by someone that looks like a Yeti, and one of the senior crew members seems to get horribly injured and near-death, and then make an amazingly quick recovery, only to go on an off-ship mission and be injured/infected again. I like this idea, and I enjoyed Scalzi’s take on it. The book is divided into sections – the main narrative, which concludes neatly, followed by two codas. I had (another) moment of fear when the main narrative completed with about a third of the book to go. Previously I read a book that was crowd-funded on a Kindle, and the last nearly 20% of the book was a long list of credits naming contributors. It’s fair to say I felt utterly cheated on that occasion – I was expecting 20% more book, and it just ended. I don’t think the narrative was incomplete in that case, but I was enjoying it and my device told me there was more. I was ready to get really cross at the ridiculousness of wasting trees on a third of a book of people’s names, when I turned the page to find the first coda. It took me a short while to settle back down again, but I did, and managed to get quite into it before we switched to the second coda. While some might find this “overly clever” and “showing off” I think it was a neat way of extending the story beyond the obvious frist narrative. I found this to be readable, and the story moved on at a good pace. The only “violence” was fairly cartoony (“and he got eaten by space worms with sharp teeth”), there’s no hanky panky (not on-the-page, anyway) and although in my head it was quite sweary I’m writing this a week later and I can’t remember if it actually *was* sweary or if I thought the characters should be swearing in the context they were in. I’d recommend it for any sci-fi fan, but this is not my new favourite book. The book is here, follow along, children! Peaks – looks too 70s and is too “snazzy” for any of the men in my life. Etna – they are doing well on naming things to appeal to me, although why this gentle-coloured design would be named after a volcano is hard to tell. I like the colour (dark teal – very “now” – or is it very “last year”? I feel like this has been Highly Fashionable for a while now, although don’t get me wrong, I’m not complaining) and I like the shape, but I’ve tried on enough misguided cowl neck garments in my time to know that the neckline, raglan sleeves and batwings would be a terrible combination with my rack. Bevel – this feels like a showcase for yarn colours. I’m a little underwhelmed by it, and have nothing witty to say. Kirigami – again, another arrestable stitch pattern, and I like the colour, but probably wouldn’t pick this one up. I’m actually more interested in the model’s hat on this one. Mason – a cowl with a brick-like stitch pattern – see what they did there? I was deeply scarred in my early twenties by someone asking me “do you still wear that throwback cowl you used to wear at Uni?” I was wearing the cowl at the time. In fairness to her, she was in the front seat of the car and I was in the back. I’m not a fan of tall cowls that are a bit loose – I prefer to be able to wrap them around for better snugness. So this wouldn’t work for me. And the main man in my life isn’t metrosexual enough to wear this. Colburn – I can see this being a staple wardrobe item for someone, but it’s not singing to me. Isthmus – If even the models look silly wearing a hat, there’s no chance I’m going to look anything other than silly wearing it. I like the cleverness of the mini-earflaps, but if I’m going to have earflaps, I want them to be definitely there. If BT are going for “a sophisticated take on the Peruvian hat” I think they are misguided. A large part of the point of those hats is their bonkers-ness, and I think it’s a mistake to take that away from them. Bevel in different colours – I’m still underwhelmed. Freja – I may be missing out on a world of awesomeness here, but I really fail to see the point of chunky cardigans with short sleeves. If I’m cold, I’m cold all over. Including on my arms. Isthmus – the beanie version. This is less silly than the earlier examples. This I might be willing to attempt, but it’s still not really anything to write home about. Geiger – I’m pretty sure I’ve seen an advert for this elsewhere. This is the one I like the most so far (apart from Douro). I like the intricate cabling and the stucturalness of it. V-neck, long sleeves & clever details. Also, this one is made in black, which I like. Having said that, black would be a bad idea for me, probably, given that my cat is mostly white. Mason in different colours – still don’t like it. Peaks – might be in different colours. Hard to tell. I’m feeling like there’s quite a lot of repetition here. Freja in different colours. I like it even less in cream. I like the picture of Douro that’s on the back cover. In conclusion, there’s a large navy blue blankie-scarf in my future, I think. They are away at the moment, so the heating is on don’t-burst-the-water-pipes settings and it seems a bit futile to turn it up just for a couple of hours on one night a week. 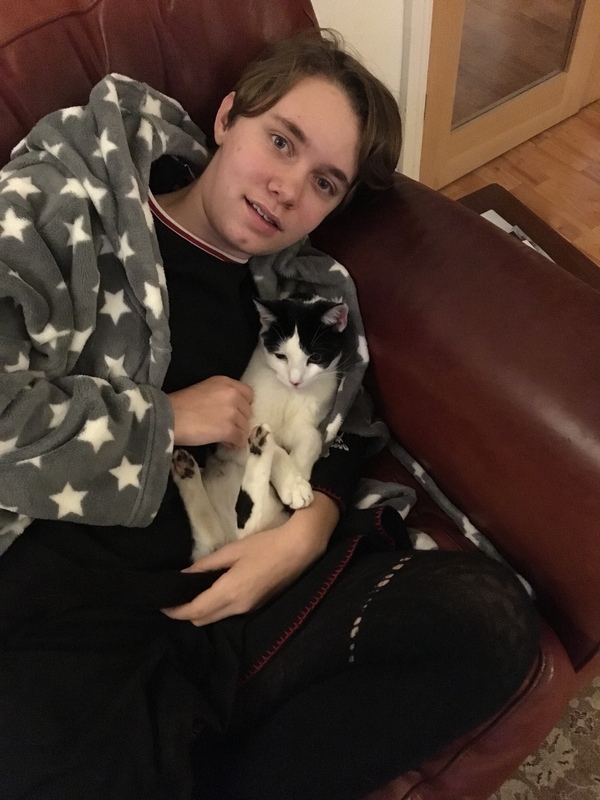 I camp out in the front room with the gas fire on, then make myself a hot water bottle about half an hour before turning in, then put on ALL THE CLOTHES (apart from tomorrow’s carefully chosen outfit, of course) and go to bed. It’s a bit tricky getting up in the morning, but not as cold as you might think, even though I had to scrape the frost off my car this morning. The one thing I’m keen to have available in this context is slippers. I went out to Ormskirk market but, if I’m honest, I was underwhelmed by the selection there. 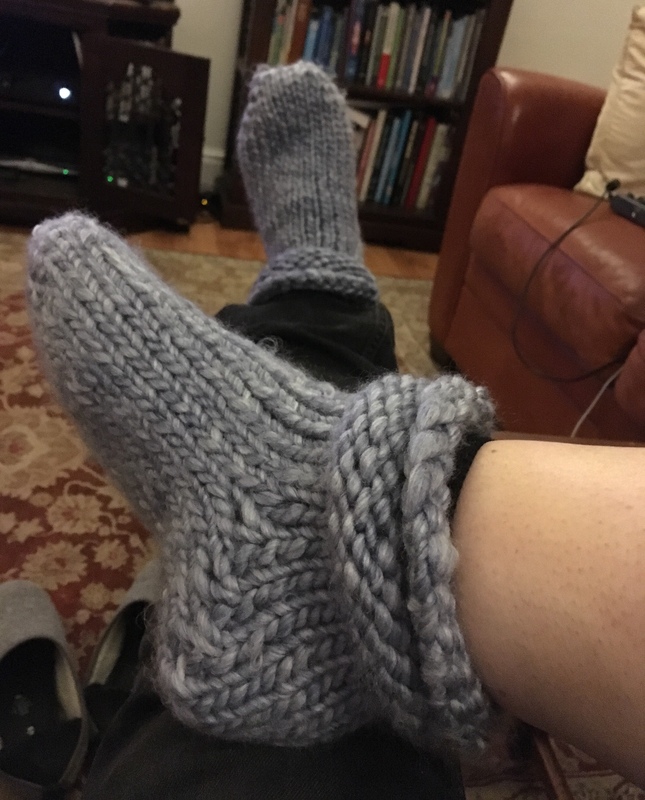 So, clearly, I took the path any sane person would, and decided to make a pair. I have some super-chunky yarn that my sister gave me, so I hit Ravelry to see what I could find that would be appropriate. I saw a few I liked and fancied having a go at, but the one that was closest to what I was after was described as “basically a pair of toe-up short-row socks”. Clearly, rather than download and follow a free pattern, I thought “I can do that”!